The X-TOUCH ONE from Behringer is a flexible DAW controller that is not only suitable for home studios, but also for live setups. It offers everything the heart desires and thus enables an optimal workflow: touch-sensitive, motorized faders and a dynamic LCD Scribble Strip, Rotary Encoder, 34 backlit buttons, 8-segment LED meters, a large jog/shuttle wheel with transport functions and more. To enable integration, the most commonly used protocols in the industry are used - i.e. everything runs smoothly and smoothly in combination with compatible DAWs, so that the focus is on what counts...the music! Practically there are sticker templates included, which show the shortcuts/functions of various buttons and controls according to the used digital audio workstation. 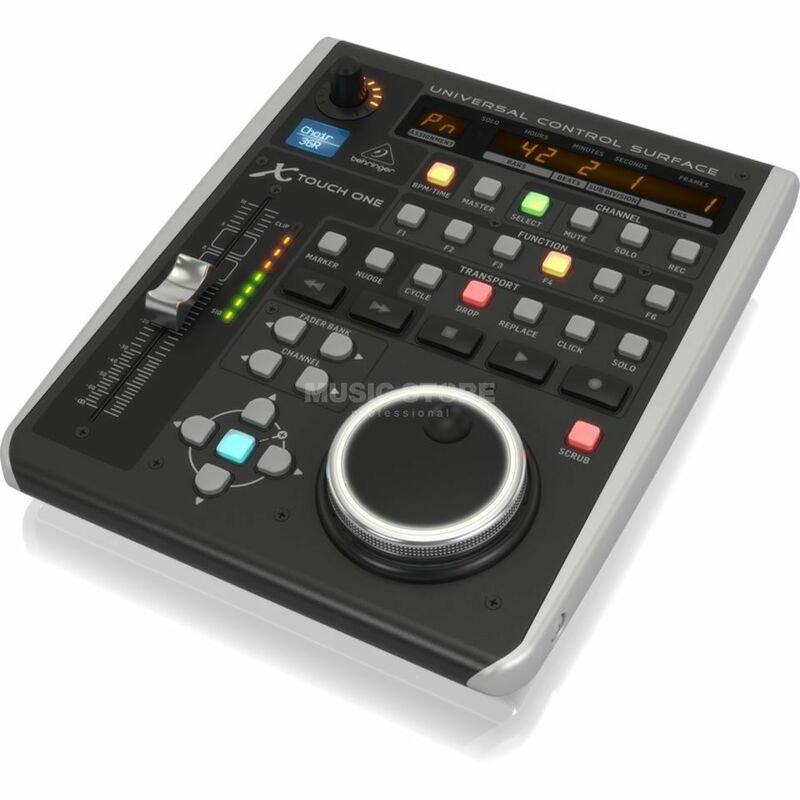 The X-Touch ONE works with Mackie Control, HUI and MIDI comminication protocols, with which all common DAWs can be operated: The buttons and controls are assigned to those of the DAW, but can also be assigned in MC User Mode (except for the upper 5 buttons of the Master/Channel section). Admittedly...these are not inexplicable movements that arise from the "power" of a fictional universe, but the function is impressive - and above all useful: the built-in, motorized and touch-sensitive 100mm fader reacts to all volume automations of the selected channel and always moves when commands are available - completely automatically and in real time. The integrated LCD Scribble Strip above the fader provides direct visual information about the track and parameters currently in use. Gone are the days when you have to stick your desk with labeled tapes. Thanks to its class-comölian USB functionality, the Touch Controller is immediately recognized by both Macs and Windows PCs. A footswitch jack allows ultra simple punch in and out applications and acts as an additional option for external remote controls. The Multi-TT USB Hub is also convenient for expanding the device for e.g. mice, keyboards or other controllers.